For the next several months I will cover the subject of color. This was a difficult subject for me when I was in school as well as when I returned to fine arts. I had no problem with color management when designing ads, brochures and the like in my old advertising life. It was somewhat easier because of the Pantone® Color System, PMS for short. Everything is pre-mixed and all you have to do is select the colors you want. In fact, it was the best part of the job. In fine arts, it's different, harder. In my college years, I never received any instruction in color. When I returned in 2000, I again didn't have any instructors who would (or may it was could) not share more than the simple color wheel. It's a tough subject. I was so confused back in the early days that one teacher wondered if I had a color deficiency. Not! So as I do in many of my workshops, I am going to share with you what I have not been taught. In the end, I hope you will know more than you ever wanted to about color--because knowledge is power. Having said all that, I want to begin with the basic painting tube. Why not the color wheel? We'll get to the wheel, but for now I want to share with you some important information that will help you understand color a little bit better. Pigment is the colored stuff that goes into your paints. It comes in powdered form and is suspended in a liquid vehicle: with watercolors it's usually gum arabic; with acrylics it's polymer emulsion and so on. Every pigment has its own Color Index name and number. For example Cobalt Blue is PB 28 or Pigment Blue #28. Why is this important? Because sometimes manufacturers are forced to combine two pigments to get the final one. Sap green (look at the M.Graham chart) is made of three different items: Chlorinated Copper, Phthalocyanine (PG 7) and Isoindolinone Yellow (PY 110). If you are having trouble mixing your colors, you may want to look at your tube to make sure that there isn't a pigment that's in conflict with another. 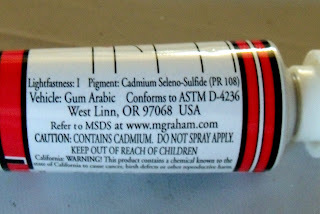 Diana Graham from M. Graham & Co., a local paint company, headquartered out of West Linn, gives us one cautionary note though, "One of the biggest points of confusion is the color name and number. This is by no way like the Pantone System. There are no rules about what we name a color and the variance from one pigment manufacturer to another can be huge even with the same name. The color index number refers to the chemical make up of the pigment, not a visual color. If you look at cad red light, medium and deep-it is all the same number." Color is the product name given to the paints (quinacridone rose, hansa yellow, sap green). Paint is the end product of mixing the pigment with the liquid vehicle. The company name: M. Graham & Co. 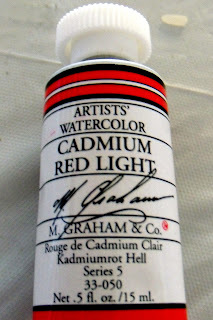 Paint quality: Artists' Watercolor (also words like Extra Fine, Finest), meaning the good stuff. Series number: Series 5. This indicates the price and also how expensive the ingredients are. A series 5 (cad red light) is more expensive than a Series 1, (burnt sienna). How much is inside: Net. 5 fl.oz./15 ml. Lightfastness (LF)means how long will it take for your paints to fade. There is a US organization called the American Society for Testing & Materials or ASTM for short. They have a class system that rates the quality and longevity of your paints. The higher the number the lower the quality. You'll usually see the numbers I, II, III. Vehicle: Gum Arabic. This is what the pigment is suspended in. 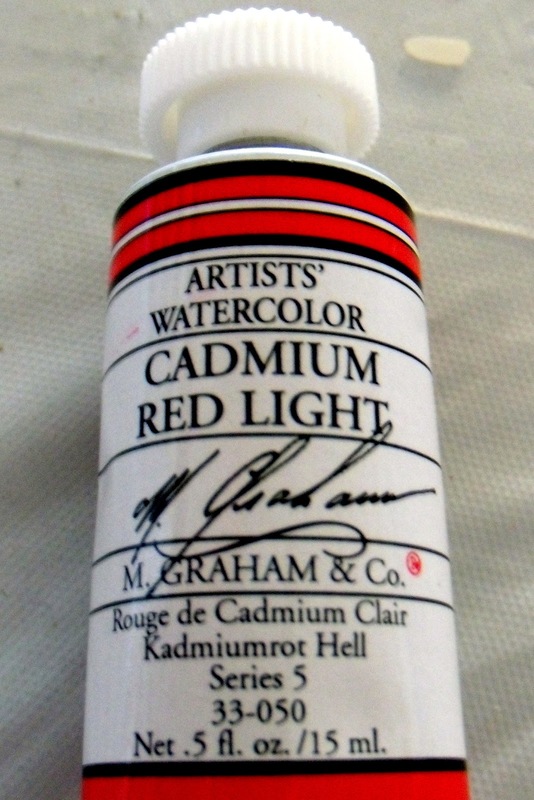 Unlike other watercolor companies, M. Grahams also adds a bit of blackberry honey that adds a touch of moistness. I have Graham paints that date back to 2004 and they are still moist! 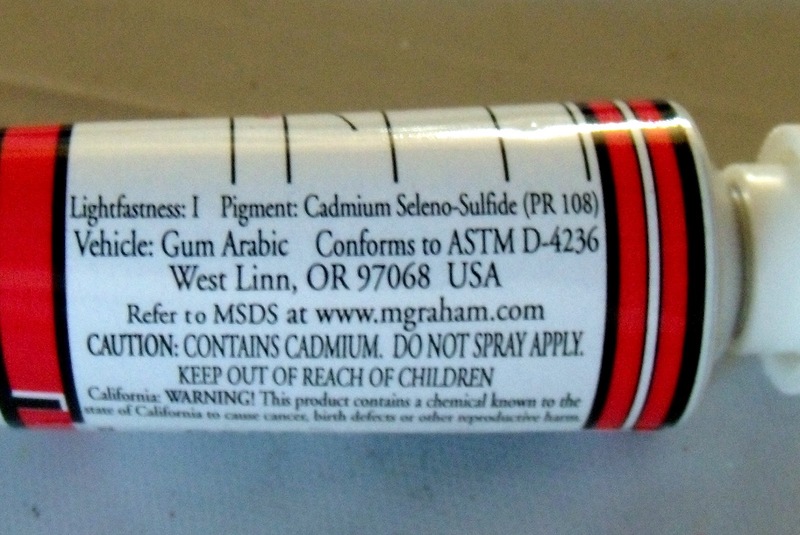 Cautionary words: There are some art materials that have been found to be hazardous and label warnings are required by federal law. Next month I'll be talking more about paints--what type of pigments are there and a new set of definitions.